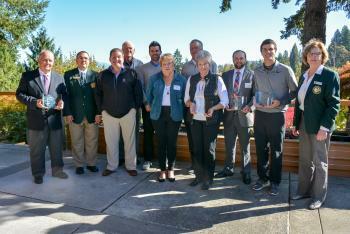 GRESHAM, ORE. ­­– Every year, the OGA gives out its Annual Awards to members, clubs, PGA Professionals and more for their commitment and diligence in working with the OGA, with their community and with other allied golf organizations. These awards were presented at this year’s OGA Annual Meeting, held October 23rd at Persimmon Country Club in Gresham, Ore. Earning Member of the Year honors was Terry “T Mac” McEvilly of Creekside Golf Club. He has volunteered thousands of hours working at OGA, USGA, and high school events, also serving on many different Creekside committees. 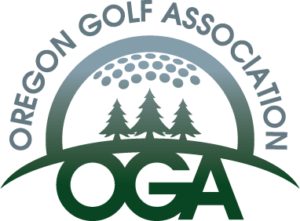 As a Senior Rules Official, McEvilly co-writes the monthly, “Rule of the Month” feature on the OGA website. He has also made a difference working with the local Creekside community. The Club of the Year went to Charbonneau Golf Club for their work in helping grow the game. The club itself has worked with the Wilsonville High School Girls Golf Team, giving free instruction to players and even having some students work in the pro shop. The Charbonneau Niners Club has donated over $6,000 to the girls golf team the past eight years, and has donated clubs and other materials to players. 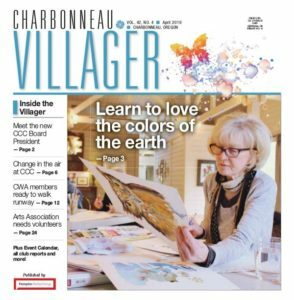 Note: This award also recognized the work done by Charbonneau with Wilsonville High School girls golf team. It has grown from 7 to 27 in the past years and they won the State Championship this year.